Acne scars and scarring can be very troubling. Normally, acne is a self-limiting condition that heals without leaving any scars or sequelae behind. However, in some cases, the acne healing process may result in visible scars. Acne scars and acne scarring may occur in various shapes and patterns, such as depressed or pitted scars, raised scars and discoloration scars. Amoderm offers many treatments from dermabrasion to laser acne scar revision and laser acne scar removal. When the acne penetrates deep into the skin, is associated with severe inflammation, or its irritated by external manipulation, the surrounding skin tissues are damaged and the natural structure of the skin and its meshwork of extracellular matrix is disrupted. This meshwork normally acts as a scaffold, guiding the cells to lay down the new components of the skin correctly, but with its destruction, the body may fail to produce and reorganized collagen in the right way. Often, too little or too much collagen is produced at the site of injury, resulting in development of the acne scar. This will also determine the shape of the acne scar: If too much disorganized collagen is produced at the site of injury, the acne scar will have a raised appearance. Raised acne scars (also known as hypertrophic or keloid scars) are more common in people with darker skin tones. Alternatively, if the body makes too little collagen during the healing process, the acne will have a pitted or depressed appearance. Depressed acne scars are further classified based on their shape to rolling, icepick and boxcar scars. Finally, healing process at time may also result in changes in pigmentation pattern of the skin, resulting in development of discoloration scars (those with hyperpigmentation, hypopigmentation and redness or erythema). Inflammatory acne: This type of acne is usually more reddish and more swollen and may present in form of cysts and painful nodules. Since this type of acne may penetrate deeper in skin, the risk of long-lasting damage resulting in scarring is higher. Delayed treatment of acne: Failing to treat inflammatory acne may increase its chance to damage skin and cause permanent scarring. Manipulating acne: Each time an acne is manipulated – picked, popped or squeezed – risk of damaging the skin and scarring increased. Family history: Some people are more prone to acne scars due to genetic factors. While it is often difficult to predict who will develop acne scars, it is important to take preventive measures. You should never manipulate active acne. Inflammatory acne is more prone to result in scarring and those suffering from more severe forms of acne should seek more aggressive treatments. Careful selection of skincare products and ongoing skin care and maintenance with facials, microdermabrasions and chemical peels on regular basis can reduce the frequency and severity of acne breakouts. How Can Acne Scars Be Treated? – Mild and superficial scars can often be treated with microdermabrasion. Monthly treatments are recommended to improve general skin tone and texture, and to reduce further acne break outs. Chemical Peels (including medical-level peels such as VI Peel can also be helpful. – Micro-needling can be effective in treating mild to moderate acne scars. Microneedling induces new collagen production which can help filling depressed or pitted acne scars. – For deeper and more noticeable scars, Laser Skin Resurfacing (MicroLaser Peel) is the next treatment to consider. 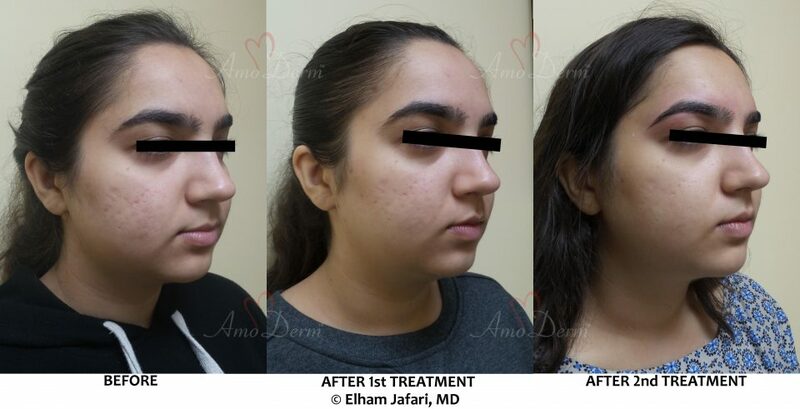 In Erbium laser acne scar removal, erbium laser beam is used to remove superficial layers of dead skin and to reduce skin surface irregularities, including scars. – CO2 Fractional Laser is also highly effective for treatment of deeper and more noticeable acne scars. During Laser acne scar removal with fractional CO2 laser, skin is treated with tiny yet powerful laser beams in a controlled pattern. The delivered energy stimulates the production and rearrangement of collagen and other components of healthy skin, rejuvenating the skin and reducing the appearance of scar and other skin irregularities. – Acne scars with redness, erythema and pigmentation changes (hypo or hyper pigmentation) can be treated with IPL (Photofacial). 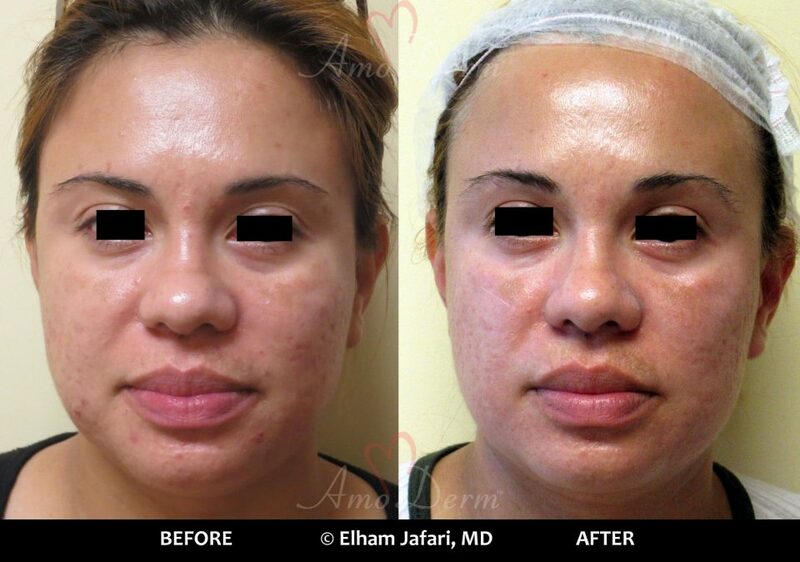 Laser Skin Resurfacing can also help with some pigmentation changes. – For depressed and pitted scars, various Dermal Fillers can be injected underneath the scarred area to raise it and make it less noticeable. The choice of the dermal filler to use to treat scars is best determined during the consultation with your doctor. Namely, Bellafill is specifically approved by the FDA for treatment of pitted scars and acne scars. – Steroid injection can be useful in treatment of raised or hypertrophic acne scars. The injections can soften the fibrous tissue and excessive collagen and help flatten the scars. Contact us today to schedule your complimentary consultation for acne scar in Orange County!